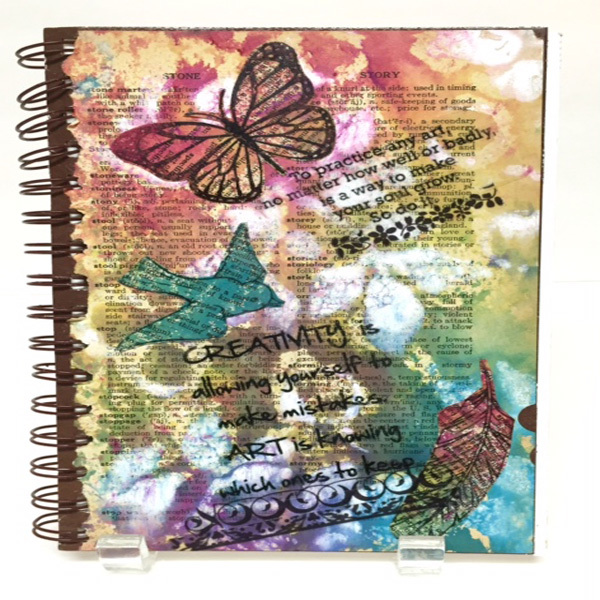 Project Description: Learn how to alter a mixed media journal with Grafix plastic film, as seen at the 2016 NAMTA trade show. Follow package directions to print collage images on Computer Grafix. Follow package directions to print faux “washi tape” on Rub Onz. Diecut design using Stencil Film. Place a dictionary page under the center of the Monoprint Plate. Spritz plate lightly using Rain Spray. Spritz plate in different areas over book page using all 3 colors of Spritzers; let colors overlap slightly in places. Do NOT apply too much ink. Let inks blend about 30 seconds, then cover plate with another dictionary page – using page underneath plate to line up. Roll page lightly with Art Wheel to transfer inks. Remove page from plate and set aside to dry or speed up dry time using heat gun. Pour out a small amount of white paint onto Inking Palette. 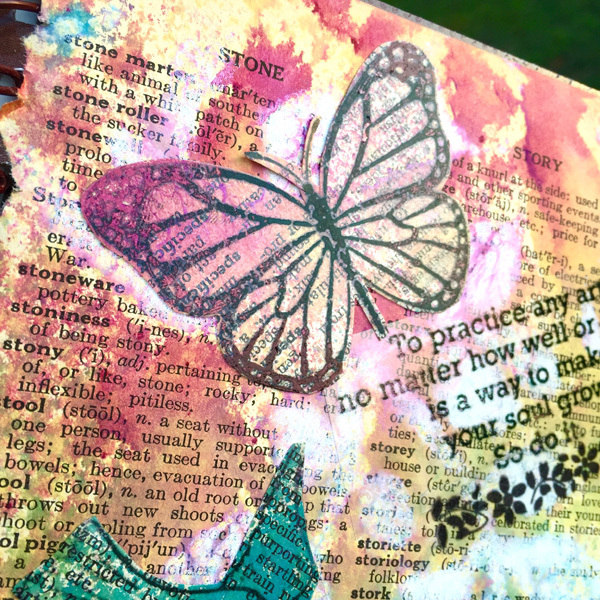 Use stencil, white paint and foam brush to add designs as desired over book page, moving stencil as needed. Use enough paint to cover open areas of stencil using a dabbing motion. Remove stencil. Dip cap of spritzer into paint and use to add circle designs over book page in between stenciled designs. Select and cut out 3 designs from printed Computer Grafix sheet. (You don’t need to trim completely at this point). Move images over one of the INK ONLY pages and decide where to place each design. Then remove adhesive backing from images and adhere to page. Cut out designs from book page. Peel and turn back the backing from half of a sheet of Artist-tac to expose the adhesive. Place sheet, adhesive side down, over the front cover of journal. Rub to transfer adhesive to cover. Line up INK and PAINT page on front cover starting at one corner and slowly lay page on book. Rub to adhere page to cover. Repeat steps 1-5 using INK ONLY page and adhere to back cover. Cut out 1 or 2 sentiments from printed Computer Grafix sheet. Without removing adhesive, place sentiment and 3 accent images on the front cover of book. Arrange placement as desired. Remove backing from sentiments and adhere to front cover. 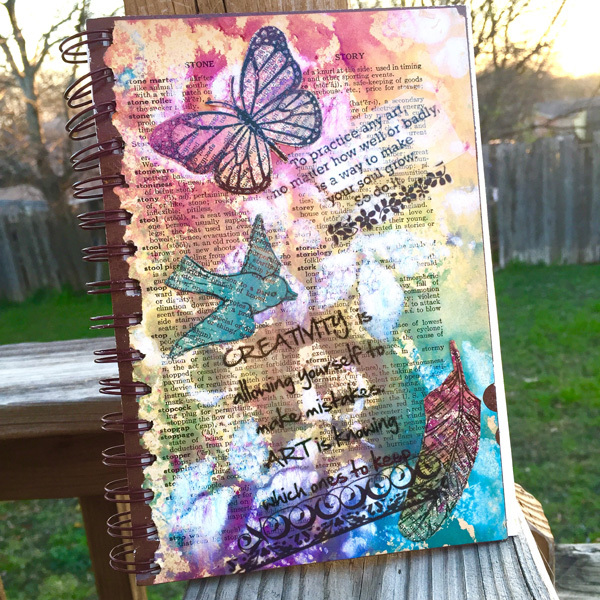 Pull and turn down a portion of backing on Artist Tac sheet to expose adhesive. Place accent images on adhesive and rub lightly to transfer adhesive. Adhere accent images to front cover. 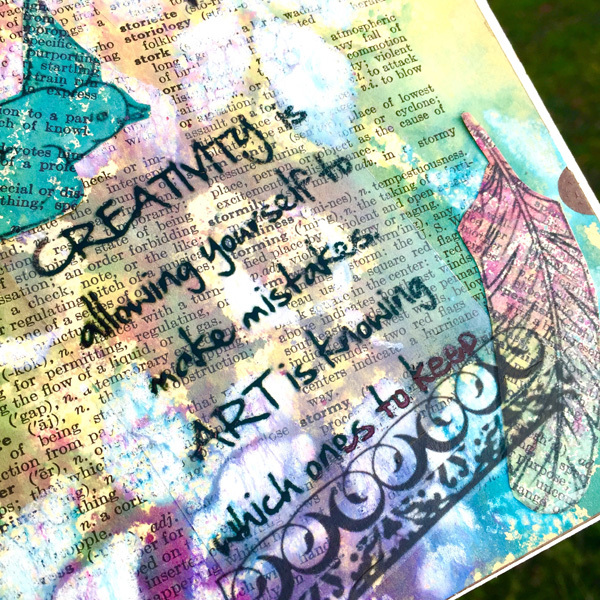 Add faux “washi tape” accents under sentiments using Rub Onz*. Cut out a block of several washi tape strips. Cut out a portion of the adhesive film sheet that will fit over the images. With white liner facing up, slowly peel way the white liner from adhesive film. Apply clear adhesive film, sticky side down, to cover design on matte side of rub onz transfer film. Using a craft stick, gently rub top of clear adhesive film to bond adhesive to design. Peel away clear adhesive film from a corner of design to reveal a sticky design underneath. Apply design sticky side down to desired surface. Using a craft stick, gently rub top of design, which is the shiny side of the rub onz transfer film to bond design to surface. Peel away shiny side of transfer film from corner of design to reveal adhered design to surface.